Buy a Bale field is required. Buy a Bale provides aid to Aussie farmers struggling to feed their families and livestock. Using the generous donations of the Australian public, Buy a Bale are able to deliver hay and water to our hurting rural communities. For more information about Buy a Bale, you can learn about it Click Here. Opt here to donate your $200 Cash Back to Buy a Bale. If you choose this option, CFI Australia will donate your $200 to the charity on your behalf. Opt here to donate your $100 Cash Back to Buy a Bale. If you choose this option, CFI Australia will donate your $100 to the charity on your behalf. Please provide your mailing address below so that we can arrange delivery of your $200 EFTPOS Card. Please provide your mailing address below so that we can arrange delivery of your $100 EFTPOS Card. See sample promo card below to locate your unique promo code. The promotion is open to individual residents or companies in Australia only ("Eligible Purchaser"). 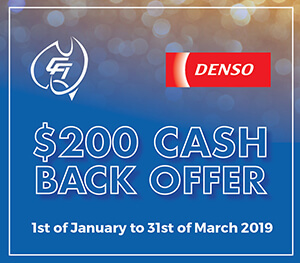 This offer is not open to employees of CFI Australia & DENSO, their affiliates, suppliers, service dealers, distributors and participating outlets or anyone connected with the promotion. Claims must be submitted by the Eligible Purchaser only. DENSO Premium Service Dealers & participating Service Dealers may not submit claims on behalf of their business customers or an Eligible Purchaser. 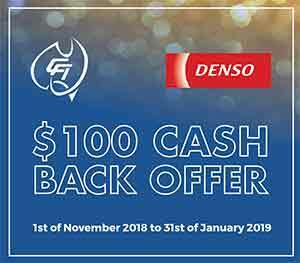 The DENSO X-Change Injector Cashback promotion is valid on purchases of full sets of specially marked packs of Genuine DENSO X-Change Injectors for Toyota Landcruiser G3S VDJ76, VDJ78, VDJ79, VDJ200 and G3P VDJ200 with a 1VD-FTV Engine, purchased through the Authorised DENSO Service Dealer Network and includes the following DENSO part numbers only: 095000-9780, 095000-9770, 295900-0480; between the 1st of January 2019 and the 31st of March 2019 ("Offer Period"). 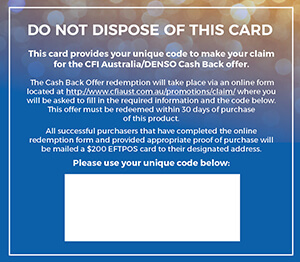 CFI Australia reserves the right, at any time, to verify the validity of claims and claimant's (including a claimant's identity, age and place of residence) and reserves the right, in its sole discretion, to disqualify any individual who CFI Australia has reason to believe has breached any of these Terms and Conditions, tampered with the claim process or engaged in any unlawful or other improper misconduct calculated to jeopardise fair and proper conduct of the promotion. Errors and omissions may be accepted at CFI Australia's discretion. Failure by CFI Australia to enforce any of its rights at any stage does not constitute a waiver of those rights. CFI Australia's legal rights to recover damages or other compensation from such an offender are reserved. Claimants must retain their purchase receipt(s) as proof of purchase. Failure to produce the proof of purchase when requested may, in the absolute discretion of CFI Australia, result in invalidation of a claimant's claim and forfeiture of any right to a cash back. Purchase receipt must clearly specify the store of purchase, that an Eligible Product(s) was purchased and that the purchase was made during the Offer Period but prior to claim. CFI Australia's decision is final and no correspondence will be entered into. Every valid claim received will be awarded with a $200 cash back offer. The cash back will be awarded in one of two forms - a $200 EFTPOS card, redeemable at point of sale terminals throughout Australia, which will be posted to the submitted mailing address within 5 business days of a valid submission; or in the form of a $200 donation to the charity organisation Buy a Bale. CFI Australia will perform the donation on behalf of the claimant. Nothing in these Terms and Conditions limits, excludes or modifies or purports to limit, exclude or modify the statutory consumer guarantees as provided under the Competition and Consumer Act, as well as any other implied warranties under the ASIC Act or similar consumer protection laws in the States and Territories of Australia ("Non-Excludable Guarantees"). Except for any liability that cannot by law be excluded, including the Non-Excludable Guarantees, CFI Australia (including its respective officers, employees and agents) excludes all liability (including negligence), for any personal injury; or any loss or damage (including loss of opportunity); whether direct, indirect, special or consequential, arising in any way out of the promotion. Except for any liability that cannot by law be excluded, including the Non-Excludable Guarantees, CFI Australia (including its respective officers, employees and agents) is not responsible for and excludes all liability (including negligence), for any personal injury; or any loss or damage (including loss of opportunity); whether direct, indirect, special or consequential, arising in any way out of: (a) any technical difficulties or equipment malfunction (whether or not under CFI Australia's control); (b) any theft, unauthorised access or third party interference; (c) any claim that is late, lost, altered, damaged or misdirected (whether or not after their receipt by CFI Australia) due to any reason beyond the reasonable control of CFI Australia; (d) any variation in reward value to that stated in these Terms and Conditions; (e) any tax liability incurred by a claimant; or (f) use of a cash back. Promotion period for the offer runs from 01/11/2018 to 31/01/2019. Only one (1) claim can be made per vehicle. Each pack of four (4) injectors sold must be allocated to a single vehicle identification number (VIN) and vehicle registration number for the offer claim to be valid. Multiple claims cannot be against a single vehicle or registration number. The DENSO X-Change Injector Cashback promotion is valid on purchases of full sets of specially marked packs of Genuine DENSO X-Change Injectors for Navara/Pathfinder with YD2K or YD25 Engines, purchased through the Authorised DENSO Service Dealer Network and includes the following DENSO part numbers only: 095000-6250, 095000-5650, 095000-6240, 295050-0300; between the 1st of November 2018 and the 31st of January 2019 ("Offer Period"). Only five (5) claims are permitted per claimant. This can be to the value of 5 x $100 EFTPOS Cards, 5 x $100 donations to Buy a Bale, or a combination of the two options. This will be valid so long as the claimant specifies a vehicle identification number (VIN) and registration number for each vehicle that the injectors have been installed in. Every valid claim received will be awarded with a $100 cash back offer. The cash back will be awarded in one of two forms - a $100 EFTPOS card, redeemable at point of sale terminals throughout Australia, which will be posted to the submitted mailing address within 5 business days of a valid submission; or in the form of a $100 donation to the charity organisation Buy a Bale. CFI Australia will perform the donation on behalf of the claimant. 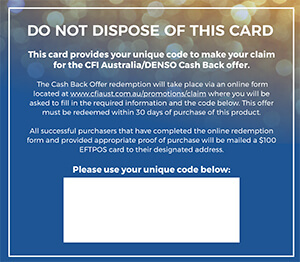 In order to receive the $100 EFTPOS card, claimants must notify CFI Australia of the correct postal address they would like the $100 EFTPOS card to be mailed to. Redemption of the $100 EFTPOS Card or $100 donation to Buy a Bale, is subject to any terms and conditions of the issuer including those specified on the Card.